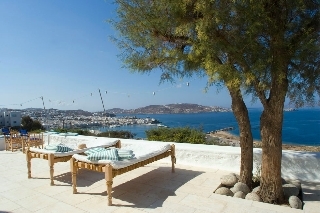 Louis house is at a three minutes walk to the old town,it is located in the middle of a large garden and overlooks the harbour ,the islands of Rhenia,Syros and Tinos. The house enjoys the cycle of the sun the whole day till the moment it sets in the sea. 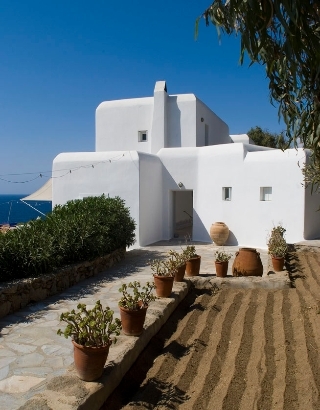 A renowned Belgian architect gave it a timeless charm, thanks to an essential conception inspired by the traditional mykonian architecture. Its simple elegance and its remarkable natural surroundings offers a world of serenity and felicity very much appreciated by its discerning guests. Sani, the house keeper, takes care of the guests in the morning and the early evening. Complimentary breakfast is served at the time of their wish. There is accommodation for up to eight guests in the main house as well as in the orchard cottage. There is a splash pool with hydromassage in the garden with an extraordinary view over the sea. Wireless internet is available in the whole house and in parts of the garden.